There are two challenges with education that we at Funzi aim to solve: We want learning to be accessible to all, and we want learning to be of high quality. Having access to high quality learning for free will allow billions of people all around the world to live happier and more sustainable lives. Funzi is designed for young, aspiring adults motivated to learn new skills. Learners are able to customize their learning paths by choosing courses from livelihood and well-being related themes. With this, we at Funzi aim to increase employment, improve lives, and stimulate the growth of local communities and economies. Funzi learning themes have been carefully selected in alignment with our vision and mission. The courses have collectively benefited nearly 6 million users, studying in Arabic, Dari, English, Finnish, Somali, Sorani, and Swahili. Courses to help improve learners’ employability and entrepreneurial skills. Courses to help everyone live healthy and happy lives. Courses to help migrants and refugees to settle into their new living environment. Courses to help everyone become global citizens and live their lives in alignment with sustainable development. 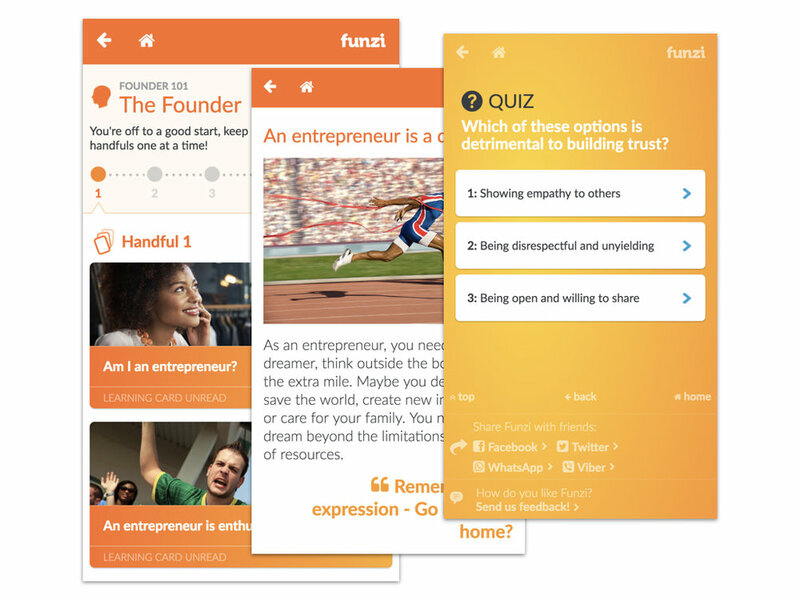 Founder 101 is Funzi's flagship entrepreneurship course to promote inclusive entrepreneurship - for everyone, everywhere, to build the skills and growth mindset to become an entrepreneur, regardless of social, economic, or cultural background. The course delves into entrepreneurship from the different perspectives and roles of an entrepreneur, developing basic skills in product development, innovation, sales, marketing, finance, organization, management, and leadership. Job-seeking skills are often taken for granted, but really, finding the perfect job is not often that easy. Through the Get that job course, participants learn basic skills related to the job-seeking process, including how to make a CV, fill in an application, prepare for an interview, and conduct yourself on the first days of the job. The course helps in building the right mindset and identifying personal strengths and potential skillsets to take the next steps on one’s career path. START LEARNING NOW – FOR FREE! 20-40 % for course modules with no extrinsic motivation for completion. 80-100 % for course modules of client courses with extrinsic motivation for completion. Funzi courses have a nearly equal 50-50 gender ratio. Funzi Communities are online and offline communities of active learners who positively impact their surrounding real-life communities. Funzi mobile learning provides a seed of lifelong learning, and Funzi Communities enable these learners to come together. The online Funzi Community is organized as Facebook group - the aim is to build in more interactivity and peer-to-peer learning in the future. Funzi Ambassadors are our most engaged users helping to spread Funzi to their communities. Funzi Ambassadors play a major role in building peer-to-peer support networks and face-to-face communities to contribute towards building sustainable societies. The Funzi Community and Ambassador Program was piloted in Nigeria in 2016, and has run as voluntary grassroots initiatives in multiple African countries. Funzi Ambassadors spread Funzi in their communities on a voluntary basis through two types of tasks: organizing events or facilitating study groups on livelihood and well-being themes. We welcome Funzi users and anyone interested in being a part of the Funzi Community to join our community group for the latest updates on new developments.